I love fall. The air is crisp and cool, every leaf becomes a flower bursting with color, and there are PUMPKINS. Pumpkins are such a fun ingredient to work with – flavorful but not overpowering, rich and satisfying. And pumpkins play well with chiles. So, I thought – I have made pumpkin lasagna before, but never with a southwest spin. This is a fabulous and flavorful combo – chiles, corn tortillas, pumpkin and pepitas adding flavor and a nice crunch. Do try! 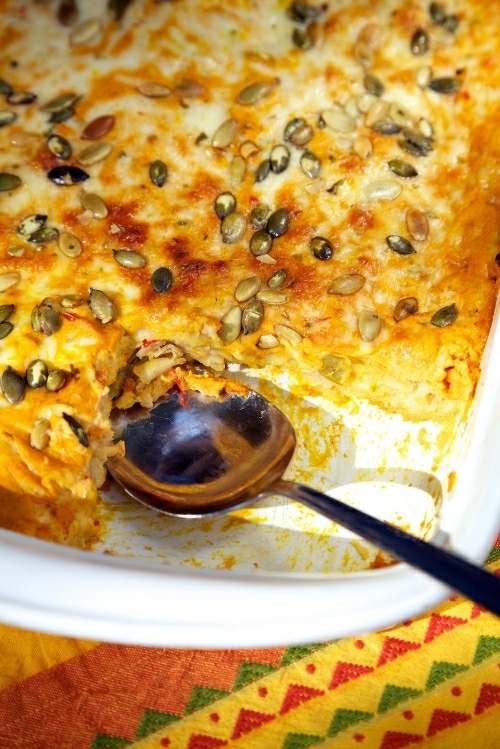 Pumpkin and chiles are blended together in this family friendly Southwest Lasagna. Turn on broiler. Slice tomatillos in half across diameter and place cut side up on a baking sheet. Chop onion into six pieces and place on baking sheet. Cut jalapenos in half lengthwise and scoop out seeds and pulp with a spoon, place cut side up on baking sheet. Lightly spray all veggies with oil and then broil for about 5 minutes, until lightly browned. Turn down oven temperature to Bake at 400 degrees. Pulse broiled veggies in a food processor until marble-sized pieces. Stir in the red bell pepper and green onions. Saute the corn tortillas in a little butter or canola oil over medium high heat until firm but still bendable, about 20 seconds on each side. Stir together the pumpkin, crema, cumin, salt, cayenne pepper sauce. Layer in a 9 by 13 inch pan as follows: a little sauce; 6 tortillas, ⅓ of veggies, cheese, sauce. Repeat twice, making three total layers. Bake for 20 minutes. Remove from oven and sprinkle on pumpkin seeds. Bake for another 10 minutes. Serve warm. How creative! I love this Fall twist on lasagna! Thanks so much Anna – it is a fall flavor fiesta! What a great idea! And it sounds incredibly delicious, as well! Thanks Deborah – and do try!